Despite leading by as much as 10 points in the fourth quarter, a furious Bucks rally upended the Pacers' six-game winning streak as Milwaukee won 106-97 in the final game before the All-Star break. Bankers Life Fieldhouse was on its feet when a Tyreke Evans 3-pointer splashed through the net, putting Indiana ahead 86-76, but the Bucks — owners of the league's best record — spent the final 9:35 in control, as Giannis Antetokounmpo's 33-point, 19-rebound, 11-assist performance was too much for the Pacers to overcome. 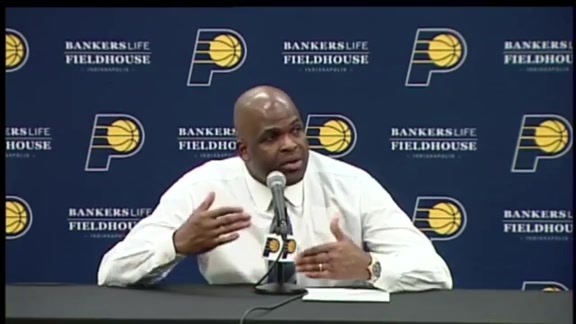 "He’s a monster," said Pacers head coach Nate McMillan after the game. "It’s a challenge to stop that kid. He does so much for that team. 19 rebounds; he is starting their break rebounding the ball and they were able to score 23 fast break points off our misses and turnovers." 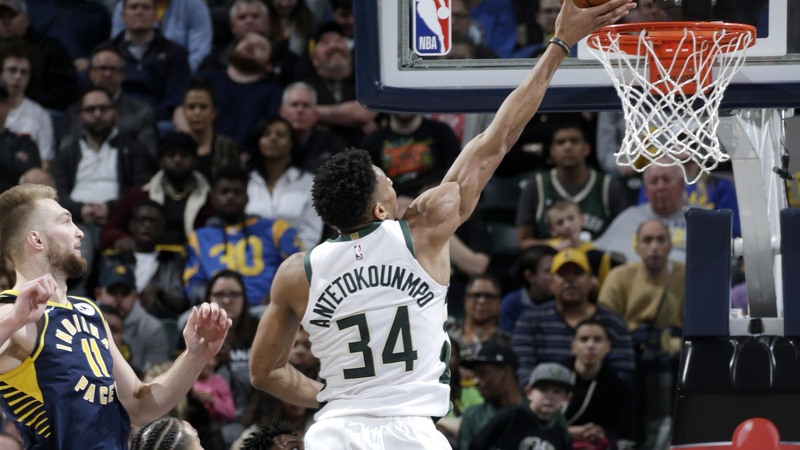 Indiana (38-20) was able to cling to its lead until Antetokounmpo backed into the paint for yet another slam, putting Milwaukee (43-14) up 93-92. The Pacers briefly regained the advantage when Thaddeus Young drilled a three from the corner, but the Bucks answered that with an 11-0 run, effectively ending the night for Indiana. 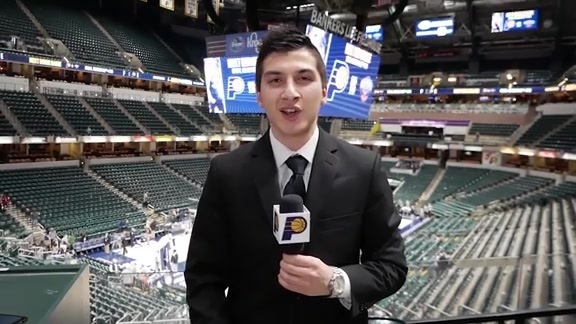 By the time the final horn sounded, the Pacers had been outscored 30-18 in the fourth quarter. In the game's early moments, Milwaukee took a quick lead, jumping ahead 12-5 when Khris Middleton made a 3-pointer from the wing. The Pacers' starting unit responded with a rally, getting the score to just a one-point Bucks lead before Milwaukee's offense sprinted ahead once again, closing the quarter on a 9-2 run to grab a 26-18 lead after 12 minutes. Antetokounmpo was especially effective, scoring 14 points in the opening quarter. "He’s a very, very tough player to guard. 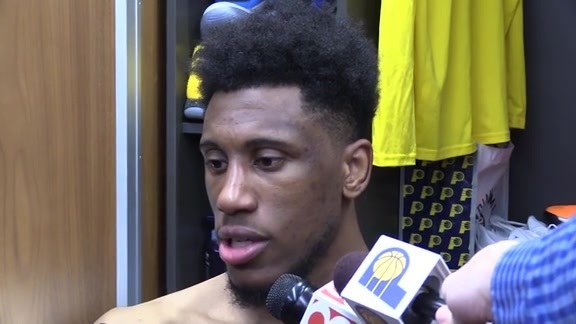 Very versatile," said Thaddeus Young, who finished with seven points and seven rebounds. "There’s only so many things you can do; but when he’s trying to post you up in the lane and is just spinning. He’s already at the rim when he takes a spin." With the bench units on the floor, Indiana opened up the scoring in the second quarter with a bucket from Doug McDermott, but the Bucks struck back, scoring seven unanswered as their lead ballooned to double digits. Following a Pacers timeout, however, Indiana's offense snapped into action, breaking off a 7-0 run of its own to chop the score down to a 35-30 Bucks lead with 7:38 remaining in the half. Late threes by Ersan Illyasova and former Pacer George Hill helped the Bucks jump ahead by 10, but a pair of free throws by Bogdanovic (20 points) with 4.1 left in the quarter helped the Pacers slice the deficit to a 55-47 Bucks lead at the break. The Pacers erupted out out of the locker room in the second half with a thundering 12-3 run as Darren Collison led the charge, scoring seven of the 12 points. In the early moments of the sprint, a defensive play by Young and Myles Turner helped ratchet up the intensity. After Young stripped Antetokounmpo, the towering Bucks forward was able to recover, only to have his shot blocked by Turner, delighting the home crowd at the Fieldhouse. Just minutes later, it was Collison again, drilling a 3-pointer to put the Pacers ahead 64-62. Caught off balance, the Bucks were able to regain their footing, getting another 3-pointer from Illyasova and a three-point play from Hill to get their deficit down to two. A free throw from Tyreke Evans closed the scoring for the quarter as the Pacers carried a 79-76 lead into the final frame. The fourth began the same way as the third — with a burst of Pacers offense. The second unit came out hot, as Evans knocked down a three from the wing to cap a 7-0 Pacers run to begin the quarter, forcing a Bucks timeout and opening up a deafening roar from the crowd. Out of the Bucks' timeout, Milwaukee stabilized itself as Middleton started to find a groove driving to the basket. An and-one from the All-Star forward was part of a 15-4 response from the Bucks, giving a 91-90 lead to Milwaukee with 5:34 remaining in the game. Although the Pacers were able to retake the lead momentarily when Young hit a 3-pointer, an 11-0 Bucks run put the game out of reach for Indiana from there. 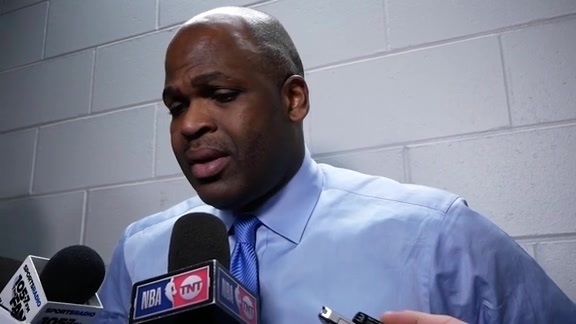 "Their defense tightened up," explained McMillan "They went to switches that we didn’t take advantage of. They had their five switching on our ball screens and we had size in the post. But we could never take advantage of that. That was the difference in the ball game." The Bucks were hot from beyond the arc, making 10-of-27 3-point shots. After a quick start, the Pacers cooled off, finishing 9-of-31. Indiana sent the Bucks to the free throw line 29 times. The Pacers made just 15 trips to the free throw line. Milwaukee had a serious edge in the paint, outscoring the Pacers 58-32. 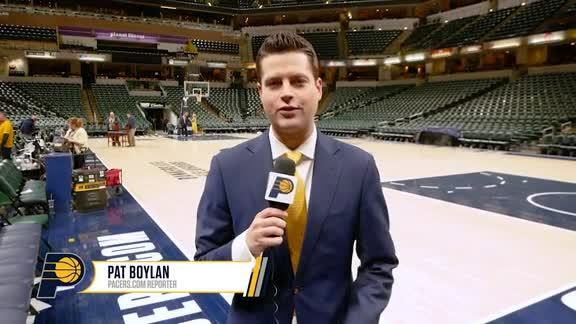 The Pacers made just two of their final 10 field goal attempts in the game. Indiana's winning streak ended up six games, marking their third streak of six or more wins this season. Milawuakee snapped a four-game losing streak when playing in Indiana. Giannis Antetokounmpo is the first player to record a triple-double with 33 or more points, 19 or more rebounds, and 11 or more assists since Kareem Abdul-Jabbar in 1976, per Basketball Reference.